UNION BEACH – Through tear stained eyes, Bonnie Siegel watched as her friend of over 20 years stepped foot onto her Union Beach property four years to the day after Superstorm Sandy ravaged New Jersey and left her home in ruins. Jen Capraun, a mother of two, joined volunteers and staff from A Future With Hope on a tour of her new home being completed by A Future With Hope on Saturday, October 29. Capraun, who struggled with the loss of her father-in-law in the midst of her fight to get back home, never missed a day at her job as special education teacher. Union Beach Mayor Paul Smith and U.S. Congressman Frank Pallone gathered alongside A Future With Hope volunteers from Cranford and Haddonfield UMCs. Mission teams from the congregations had been working on the Capraun home since the early morning. Acknowledging that rebuilding is just one step in the recovery process, a special gift card was donated to the Capraun’s to help them refurbish their home with items lost in the storm. Thanks to good friends like the Siegel’s, Capraun didn’t bear her burdens alone. Rev. Chris Heckert, a member of the Board of Trustees for A Future With Hope and pastor of Haddonfield UMC spoke at the event, highlighting the work that remains years later and the more than 4,000 families who have not recovered. “The winds and rain were quick to harness a storm four years ago, but we were quick to harness the power of hope through volunteers. But we don’t need a storm to spread hope,” Heckert said, adding that A Future With Hope would continue to harness the power of what it’s built over the last few years to provide people with hope through Hope Centers. “While other recovery organizations have scaled back and closed up, we’re here to stay,” said Heckert, explaining that the good will and energy created in response to Sandy through the organization would live on to meet needs throughout New Jersey. The Capraun home will be the 250th rebuilt by A Future With Hope with the help of more than 11,000 volunteers. To accomplish this feat, the organization has received support from The Robin Hood Foundation, The American Red Cross, The Hurricane Sandy New Jersey Relief Fund, The United Methodist Committee on Relief, as well as congregations, individuals and organizations from across the region. They work in partnership with other long-term recovery groups including The Affordable Housing Alliance, OCLTRG, SBP, The Episcopal Relief and Development and others. 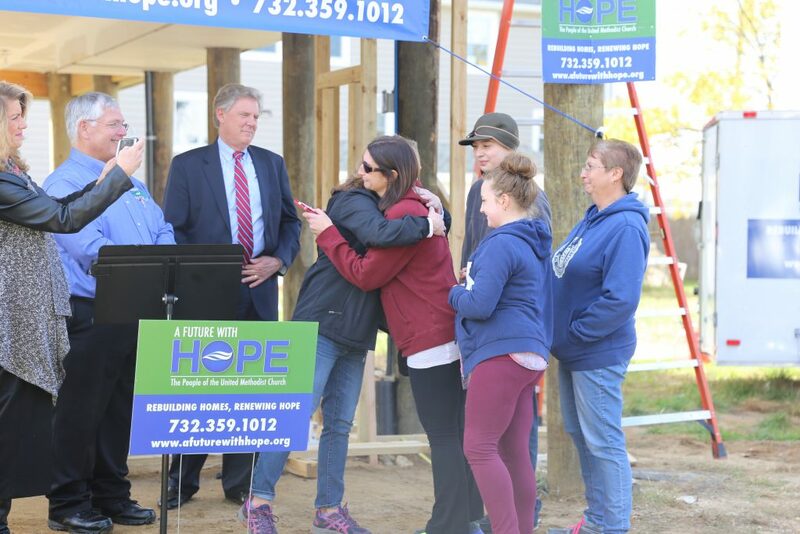 A Future With Hope will continue its evolution living into its name by providing hope throughout New Jersey by means of Hope Centers that will build up communities and provide needed services. Camp YDP, a preschool, aftercare program and summer camp in Paterson will be the first Hope Center and eight other opportunities have been identified to join the movement.